Pizza on the grill? There's nothing better! Here's a tasty recipe for an easy Pesto Pizza that will have your whole family asking for more! Preheat your grill. Lightly spray tin foil with oil before placing your flatbreads or pizza dough on top. 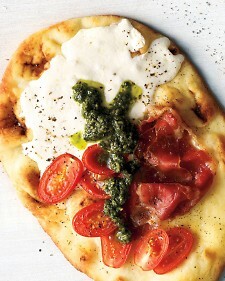 Brush flatbreads or pizza dough with olive oil, then add your favorite toppings. Season with salt and pepper. Transfer to bbq; bake until bottoms are crisp and toppings are heated through, 5 to 7 minutes. Top with dollops of Basic Basil Pesto and serve immediately. Here's a quick tip: If you buy a bottle of store bought pesto (only buy the best quality!) and you have left overs, simply spoon it into ice cube trays and freeze. When hardened, transfer pesto cubes into a freezer bag, and thaw when you're ready to use them again.